Right now you can snag an Instant Pot Duo on Amazon for 20 percent off. The Instant Pot pressure cooker has inspired a fierce fan base. More than 1.3 million people belong to the Instant Pot Facebook community and the top YouTube videos featuring the Instant Pot garnered more than a million views. 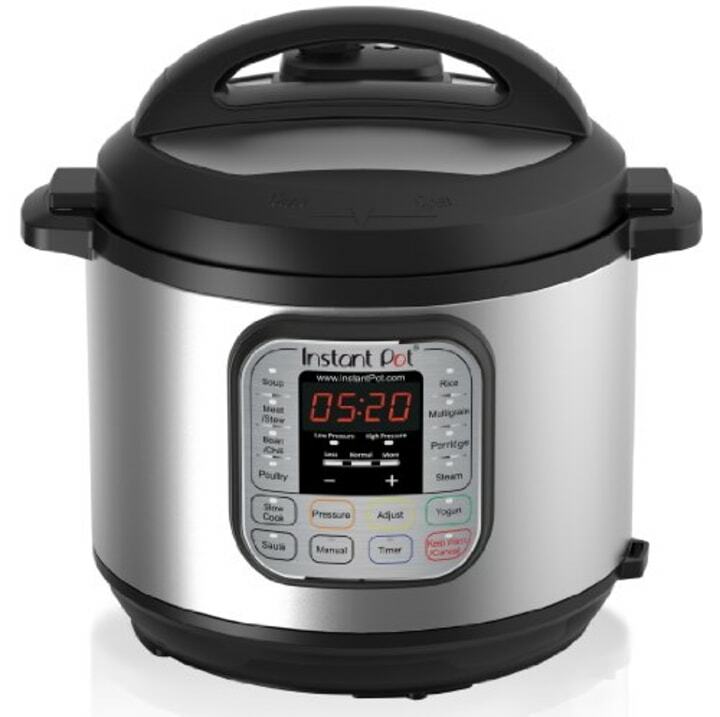 If you read any of the reviews or the Facebook groups, you'll understand why people are so into this programmable pressure cooker. Maybe you've heard your best friend … and mom … and coworker … and cousin … all talk about how it's changed their lives, turning meals that used to take hours into meals that take minutes. And, now you're considering buying an Instant Pot for yourself. So, I tried it. And, I'm here to echo the millions (literally, millions) of people online raving about the thing: the Instant Pot is worth it. Before you take the plunge, you'll probably feel a little intimidated and overwhelmed. Don't worry! This is not a scary stovetop pressure cooker that threatens to blow the house down every time it jiggles menacingly. This is a state of the art, stainless steel, super-sophisticated machine that will, in fact, change your cooking habits for the better. Even us recipe professionals have fallen head over heels for how easy and intuitive it is to get great results! If you've ever used a slow cooker or a rice cooker, you're already halfway to becoming an Instant Pot expert. If you haven't then definitely follow these five tips to really get the most out of the pressure cooker. Unlike your circa-1993 dorm microwave with its mysterious "potato" and "casserole" buttons, these function keys are actually, well, functional! For pressure cooking novices, the Instant Pot's preprogrammed setting — including soup, poultry, rice, beans and chili, and stews — take most of the guesswork out of how long and how high to pressure-cook a meal. Once you get more comfortable with the Instant Pot, it's easy to make adjustments to time and temperature. But the preset functions make you feel comfortable using it right off the bat. I've been making the same slow-simmered chili recipe on the stove for years with canned beans, but now I set a button and have a big batch made with healthier dried beans ready to go in an hour. No-stir risotto is something even my husband can accomplish, and I'm more than impressed that my favorite Thai coconut curry only takes 20 minutes for chicken thighs as tender as if I braised them for hours. Pour 1 cup of water into the Instant Pot before reheating anything — the moisture is necessary to bring it up to pressure. For packaged meals or potstickers, remove any plastic wrap and place the food on the provided steamer rack or your own steamer rack. For frozen leftovers, place the block of food in a small oven-safe casserole dish on the rack. Timing will vary based on what you're reheating; potstickers will only take about 3 minutes, but larger portions need 7-10 minutes to thaw through. All current Instant Pot models come with a saute function in addition to the preprogrammed timed settings — a feature that not every basic slow cooker can boast. If you've ever had to wash a separate skillet after messily dumping ground beef or sautéed onions into your slow cooker insert, you'll understand 100 percent why this built-in function is a lifesaver. It's truly a one-pot wonder — use the Pot as you would a skillet on a stovetop before switching to pressure cooker mode for a seamless transition. Fewer dishes? That's worth it in my book. While it's possible to make as little as two servings of rice in 10 minutes with your Instant Pot, the horsepower (pressure power?) that makes it so effective also makes it a no-brainer to cook large quantities in just as short a timespan. This is how the Instant Pot has magically turned me into a better meal planner: I'll cook double the quantity of rice, beans, or other meal building blocks, then portion the cooked food into freezer-safe bags and freeze in flat layers. I'll let the bag of cooked beans defrost in the fridge all day until we're ready for dinner tacos, and if I'm really pressed for time, rice will defrost on the counter in minutes — ready to go with quick-steamed vegetables and shrimp I threw into the Instant Pot right from the freezer. One last note: while it seems silly to remind anyone to wash their dishes, it's important to keep the rubber sealing ring and the anti-block shield inside the lid squeaky clean. Residue from pressure-cooked food can build up on both, and the rubber ring can accumulate odors over time. To keep your Instant Pot working in top condition, follow the manufacturer instructions and remove them for a good scrub in between meals. Not ready to take the pressure cooker plunge? TODAY Food has rounded up the best crock pots and slow cookers on the market! This article was originally published on September 8, 2016 on Today.com.